Another lap around the sun! I finally hit that half a century milestone of 50 years on planet earth. It only seemed like yesterday that I was in my 20s, and to be honest, I still feel like I am, in my heart and soul and I don’t think my mind will ever really grow up! And that is the best part of being who I am as a neurodivergent individual, mentally feeling younger than who I should be and often as with many of my fellow neurodivergent community, we tend to look that much younger, as I have been told. Mind you, I just wish my physical body would feel like I was 20 too! Now, this is my first newsletter that I have been promising myself to mail out to you all since the beginning of the year, and what a busy year it has been for me so far. I had a wonderful event where I was moderator for best-selling author Graeme Simsion’s Rosie Result book tour at Brisbane Powerhouse in February along with Professor Tony Attwood. That was a really fun and enlightening event. If you haven’t yet read The Rosie Result, get onto it as it is, in my opinion, the best book of the Rosie Trilogy. I have also started back into my Master of Autism studies at the University of Wollongong where my focus is on employment. I am lucky with this program that I can diversify from the usual education focus and implement my learnings, research and assignments around the area of employment which I am extremely passionate about. This brings me to a very exciting event I am speaking in Brisbane on the 31st May. The Neurodiversity & Employment Symposium will be a full day event dedicated to educating and enlightening employers about the significant benefits of employing a neurodiverse workforce. There will be neurodivergent individuals like myself and Yenn Purkis and dyslexia advocates Jemima Hutton and Katie Small, speaking about our perspectives in the workplace and how employers can support people like us thrive in their jobs. Plus, there will be great information from Epic Assist and Specialisterne Australia with speakers Bill Gamack and Vicky Little respectively, clinical psychologists Professor Tony Attwood and Dr Michelle Garnett and Thriving Now’s director, co-creator and psychologist Jay Hobbs. It is looking like a seriously great event, and tickets are selling fast for this one. Neurodivergent individuals also get the heavily reduced ticket price of only $59. Don’t miss this! Now, before this fantastic upcoming employment event, I do have some rather exciting news with a special event I have been asked to speak at in Washington DC, USA on Wednesday the 23rd of April. This event has been organsied by the National Institute of Mental Health (NIMH) and Office of Autism Research Coordination (OARC) and is a special event for Autism Awareness (I do prefer Acceptance!) Month focusing on “A Woman’s Voice: Understanding Autistic Needs.” Fellow author, speaker and advocate Jennifer Cook O’Toole and I will be opening the event and then will come together for a panel discussion with Liane Holliday Willey whose book, Pretending to be Normal, was one of the books that set me on my path to self-discovery and diagnosis. This wonderful lady is someone who I have admired immensely, and I finally not just get to meet, but also speak alongside of. Dena Gassner, fellow Spectrum Woman, researcher, writer and speaker will make up the great panel of women for the hour discussion. This event is FREE and can be listened to live via conference call. All you need to do is register through the link below and you could also be joining us from anywhere in the world. How cool is that! While I am in the US, I will be visiting another of the Spectrum Women authors and writers, Becca Lory in Colorado. 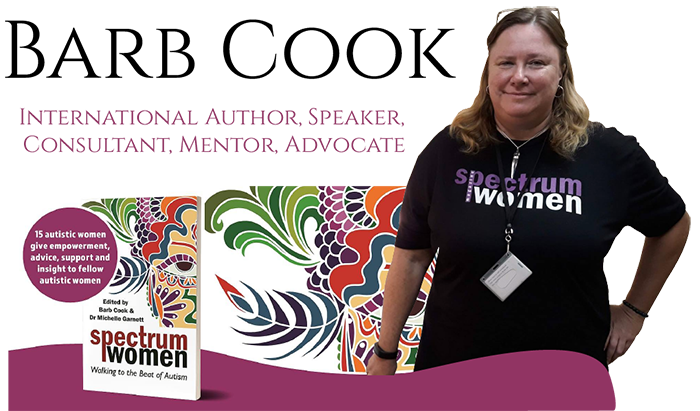 Becca will be part of an event at Barnes & Noble bookstore in Fort Collins where you can come and hear Becca speak and grab a copy of the Spectrum Women book and have it signed too. 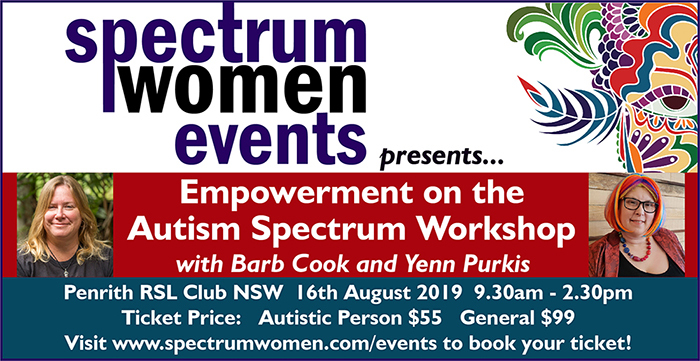 Seeing as I am talking all things Spectrum Women, Friday, August 16 will see Spectrum Women’s first workshop with myself and Yenn Purkis in Sydney. This day workshop will focus on the empowerment of individuals on the autism spectrum, with the theme of this workshop spotlighting gender in a variety of settings (workplace, social, school, etc. ), what challenges can be experienced and provide strategies, insights and tools to facilitate self-advocacy, self-determination and self-confidence. This workshop will be one of the first of its kind in Australia with actually autistic people organising and presenting the whole event. I think it is about time that our voices were heard, very loud and proud, of what we have experienced, how we overcome situations, what we learned and how we can pass onto you, a wealth of knowledge, plus, most of all, we know how it feels as we have been through it too. This event is priced with fellow autistics in mind with tickets only $55 and $99 for everyone else. I don’t think you will get a better value for money day than this one! Make sure you get on over and book your ticket and make sure you tell your friends, and more importantly, people who will benefit from learning about autistic individuals by listening to them directly. So maybe slip a sneaky email about this event to your boss, mother, friend, teacher…. You get the idea… wink, wink! Join me on social media to keep up to date with my latest news and projects!